^ Coolidge, William Augustus Brevoort (1911). "Switzerland/History/Constitution" . In Chisholm, Hugh (ed.). Encyclopædia Britannica. 26 (11th ed.). Cambridge University Press. p. 259. The enlargement of Switzerland by way of the admission of new cantons to the Swiss Confederation ended in 1815, and the territory of Switzerland was fixed by 1863. After the end of the First World War, there was a campaign in Vorarlberg to join Switzerland, a corresponding proposal was submitted by Jurassian representative Dominique Baettig in 2010, but was dropped after Baettig was not reelected in 2011. For a list of Swiss cantons by year of accession, see Cantons of Switzerland, the accession of Appenzell in 1513 completed the growth of the Confederacy into the Thirteen Cantons of the early modern period. The Valais became an associate of the Confederacy in 1529. In 1536 the Swiss canton of Berne annexed the Vaud from Savoy, Geneva had sought alliances with the Swiss Confederacy since the early 16th century. In addition to the cantons, the Old Swiss Confederacy had several associated states, which included the Sieben Zenden, the Three Leagues, Grisons acceded with the Act of Mediation in 1803. At that time, the territory of Tarasp, formerly an exclave within the territory of the League of Gods House, was ceded by Austria. Similarly, the newly created canton of Aargau included the territory of Fricktal, the Canton of St. Gallen was created at the same time, out of a number of disparate territories, which had however all been previously either allied with or subject to Swiss cantons. 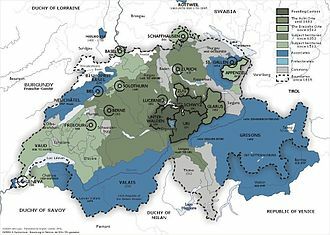 The territory of Geneva was fragmented, with various enclaves or exclaves of Savoyard and French territory, the Valtellina had been a territory of the Three Leagues from the 15th century until 1797, when it was annexed by the Cisalpine Republic. The loss of the Valtellina remained an irredentist issue in Grisons well into the 20th century, along with the Valtellina, Chiavenna was lost to the Cisalpine Republic in 1797, and the Congress of Vienna likewise declined its restoration to Switzerland. While Switzerland accepted the loss of Chiavenna itself, the Valle di Lei north of Chiavenna was indicated as Swiss territory on the Dufour map of 1858 and it was only in 1863 that Switzerland reached an understanding with the Kingdom of Italy on the exact definition of the Swiss-Italian border. 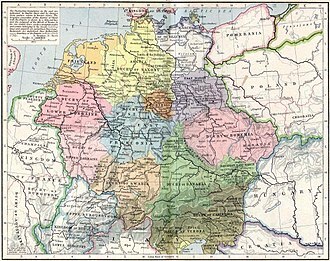 The Duchy of Swabia was one of the five stem duchies of the medieval German kingdom, and its dukes were thus among the most powerful magnates of Germany. Swabia takes its name from the tribe of the Suebi, dwelling in the angle formed by the Rhine and the Danube, they were joined by other tribes, and were called Alamanni, until about the 11th century, when the form Swabia began to prevail. The duchy was proclaimed by Burchard II in 917, Burchard had allied himself with king Conrad I and defeated his rivals for the rule of Alemannia in a battle at Wahlwies in 915. 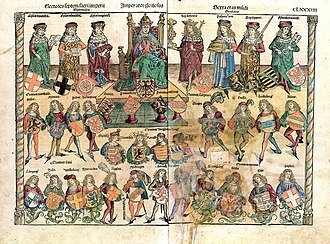 The most notable family to hold Swabia were the Hohenstaufen, who held it, with a brief interruption, for much of this period, the Hohenstaufen were Holy Roman Emperors. The duchy persisted until 1268, ending with the execution of Conradin, Rudolph I of Germany in 1273 attempted to revive the title of duke of Swabia, bestowing it on his youngest son, the Rudolf II, who passed it to his son John Parricida. 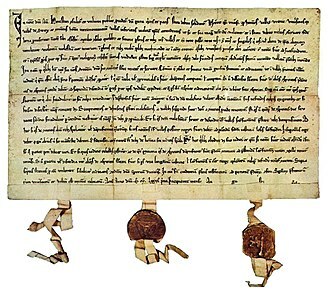 John died without an heir, in 1312 or 1313, marking the end of the revived title, the Margraviate of Baden detached itself from the duchy in the 12th century. In 496 the Alamanni were defeated by King Clovis I, brought under Francia, in the 7th century the people were converted to Christianity, bishoprics were founded at Augsburg and Konstanz, and in the 8th century abbeys at Reichenau Island and Saint Gall. At this time the duchy, which was divided into gaus or counties and it was bounded by the Rhine, Lake Constance, the Lech River and the Duchy of Franconia. 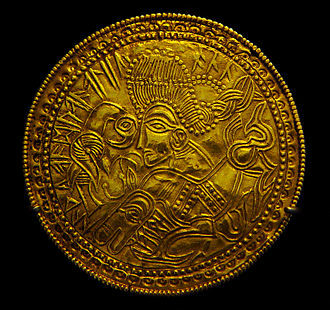 During the and weaker years of the Carolingian Empire the counts became almost independent, the chief family in Alamannia was that of the counts of Raetia Curiensis, who were sometimes called margraves and sometimes, as in the case of Conrad II and Rudolf, dukes. Finally, Burchard I, was called duke of the Alaminnia and he was killed in 911, for which two counts palatine and Erchanger, were accused of treason and put to death by order of the German king Conrad I. In 917, Burchard II, son of Burchard I and count in Raetia Curiensis, took the title of duke, and was recognized as such by King Henry I, the Fowler in 919. In the Battle at Winterthur in 919, Burchard defended the Thurgau against the claims of Rudolf II of Burgundy, Rudolf had attempted to expand his territory by capitalising on the feud between the Ahalolfing and Burcharding dynasties. He occupied the palace at Zürich and marched into the Thurgau from there and he was defeated by Burchard near Winterthur and was forced to abandon Zürich, retreating beyond the Reuss. Burchards position was virtually independent, and when he died in 926 he was succeeded by Hermann, a Franconian noble, liudolf revolted, and was deposed, and other dukes followed in quick succession. Burchard III, son of Burchard II, ruled from 954 to 973, when he was succeeded by Liudolfs son, afterwards duke of Bavaria, to 982, and Conrad I, a relative of Duke Hermann I, until 997. Hermann II, possibly a son of Conrad, and, during these years the Swabians were loyal to the kings of the Saxon house, probably owing to the influence of the bishops. Hermann III had no children, and the passed to Ernest II, son of his eldest sister Gisela and Ernest I. Late antiquity is a periodization used by historians to describe the time of transition from classical antiquity to the Middle Ages in mainland Europe, the Mediterranean world, and the Near East. The development of the periodization has generally been accredited to historian Peter Brown, precise boundaries for the period are a continuing matter of debate, but Brown proposes a period between the 3rd and 8th centuries AD. Generally, it can be thought of as from the end of the Roman Empires Crisis of the Third Century to, in the East, the early Islamic period, following the Muslim conquests in the mid–7th century. 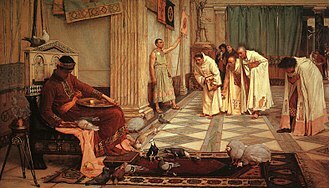 In the West the end was earlier, with the start of the Early Medieval period typically placed in the 6th century, beginning with Constantine the Great, Christianity was made legal in the Empire, and a new capital was founded at Constantinople. 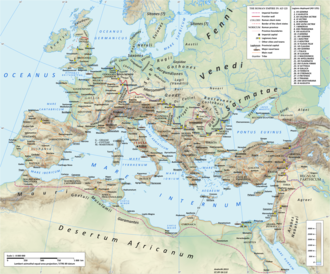 The resultant cultural fusion of Greco-Roman and Christian traditions formed the foundations of the subsequent culture of Europe, the term Spätantike, literally late antiquity, has been used by German-speaking historians since its popularization by Alois Riegl in the early 20th century. 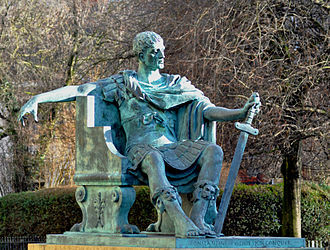 Concurrently, some migrating Germanic tribes such as the Ostrogoths and Visigoths saw themselves as perpetuating the Roman tradition, Constantine confirmed the legalization of the religion through the so-called Edict of Milan in 313, jointly issued with his rival in the East, Licinius. Monasticism was not the only new Christian movement to appear in Late Antiquity, notable in this regard is the topic of the Fifty Bibles of Constantine. Within the recently legitimized Christian community of the 4th century, a division could be distinctly seen between the laity and an increasingly celibate male leadership. 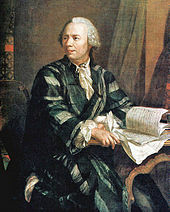 Celibate and detached, the clergy became an elite equal in prestige to urban notables. The Late Antique period saw a transformation of the political and social basis of life in. The Roman Empire was in a sense a network of cities, archaeology now supplements literary sources to document the transformation followed by collapse of cities in the Mediterranean basin. Burials within the urban precincts mark another stage in dissolution of traditional urbanistic discipline, overpowered by the attraction of saintly shrines, in Roman Britain, the typical 4th- and 5th-century layer of black earth within cities seems to be a result of increased gardening in formerly urban spaces. The French invaded Switzerland and turned it into an ally known as the Helvetic Republic. 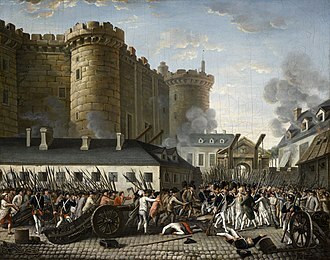 The interference with localism and traditional liberties was deeply resented, although some modernizing reforms took place, resistance was strongest in the more traditional Catholic bastions, with armed uprisings breaking out in spring 1798 in the central part of Switzerland. 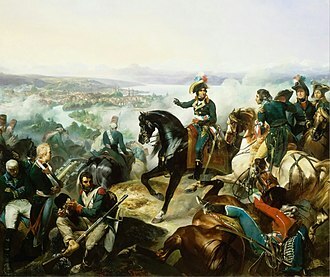 During the French Revolutionary Wars of the 1790s, the French Republican armies expanded eastward, the French Republican armies enveloped Switzerland on the grounds of liberating the Swiss people, whose own system of government was deemed as feudal, especially for annexed territories such as Vaud. Some Swiss nationals, including Frédéric-César de La Harpe, had called for French intervention on these grounds, the invasion proceeded largely peacefully, since the Swiss people failed to respond to the calls of their politicians to take up arms. On 5 March 1798, French troops completely overran Switzerland and the Old Swiss Confederation collapsed, on 12 April 1798,121 cantonal deputies proclaimed the Helvetic Republic and Indivisible. 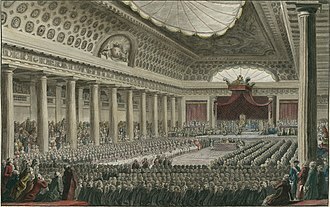 On 14 April 1798, an assembly was called in the canton of Zürich. 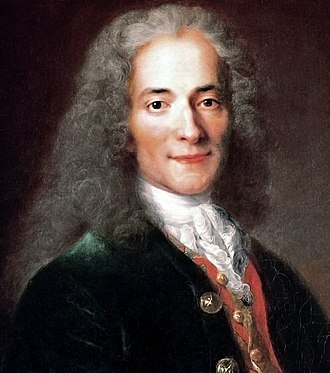 The new régime abolished cantonal sovereignty and feudal rights, the occupying forces established a centralised state based on the ideas of the French Revolution. Many Swiss citizens resisted these ideas, particularly in the central areas of the country. Some of the controversial aspects of the new regime limited freedom of worship. 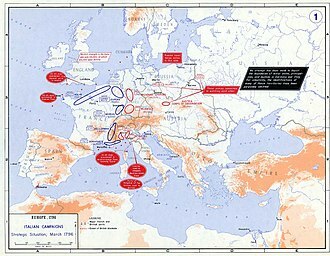 In response, the Cantons of Uri and Nidwalden raised an army of about 10,000 men led by Alois von Reding to fight the French and this army was deployed along the defensive line from Napf to Rapperswil. 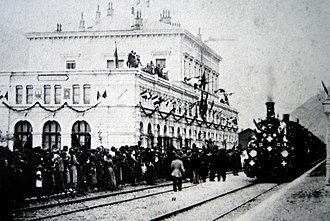 Reding besieged French-controlled Lucerne and marched across the Brünig pass into the Berner Oberland to support the armies of Bern, at the same time, the French General Balthasar Alexis Henri Antoine of Schauenburg marched out of occupied Zürich to attack Zug and the Sattel pass. Even though Redings army won victories at Rothenthurm and Morgarten, Schauenburgs victory near Sattel allowed him to threaten the town of Schwyz, on 4 May 1798, the town council of Schwyz surrendered. The military history of Switzerland comprises centuries of armed actions, and the role of the Swiss military in conflicts and peacekeeping worldwide. Formed with the Federal Charter of 1291, an alliance of three cantons was formed for defense, chiefly against the Habsburgs. A succession of interventions by the Habsburgs produced the battles of Morgarten and Sempach, by 1353 the original three cantons had been joined by two additional cantons and three city states. Late in the century, soldiers drawn from the cantons of Switzerland gained a military reputation throughout Europe. This reputation was earned as a result of their defense against the Austrian Habsburg overlords, by the fifteenth century the Swiss had become particularly valued as soldiers-for-hire. Swiss soldiers were noted for their skill and ferocious attacks in the Phalanx, or deep column formation using pike. They had a monopoly on pike mercenary service up until 1490. By 1490 German mercenaries became proficient in Swiss military tactics and were available for hire at a lower cost, in 1515 the Swiss pledged themselves to neutrality, and they only continued to fight in the service of the Royal French army. They became bitter rivals with the German mercenaries and the two would fight on the battlefields of Europe during the next few decades. Following the Battle of Marignano in 1515, the Swiss style of fighting went into steady decline, to be replaced by the arquebusiers, artillery. 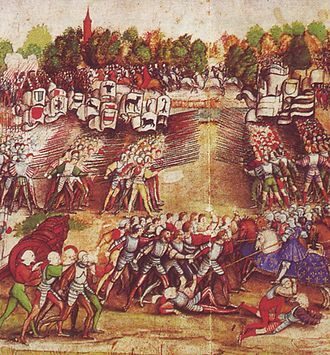 During the Battle of Bicocca in 1522 the Swiss mercenaries saw a defeat with heavy casualties. Nonetheless Swiss continued to serve as mercenaries during the two centuries, adopting the musket to replace the pike. The Swiss Guard has its origins in 1506 when Pope Julius II hired them as bodyguards and this is appropriate, seeing as the Papal States took up one-third of Italy at the time, requiring extensive protection. The pope enlisted them, seeing as he believed they were best at the time, currently, it is illegal for Swiss citizens to join another countrys armed forces except as members of the Swiss Guard protecting the Vatican is the sole exception. Military service abroad of dual nationals is permitted under certain circumstances, the Swiss peasant war of 1653 was a popular revolt by the rural populations of several cantons. Huldrych Zwingli (woodcut by Hans Asper, 1531). The forces of Zürich are defeated in the battle of Kappel. Depiction of Swiss mercenaries assaulting the Landsknecht mercenaries in the French lines at the Battle of Marignano, 1515. 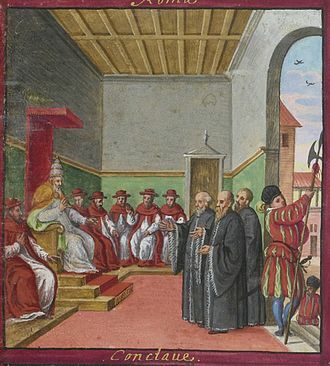 Conclave with Pius V, a Swiss Guard guarding the entrance, ca. 1578. A battalion of soldiers advance during the Battle of Meierskappel. The battle was fought during the Sonderbund War, a civil war in 1847. Swiss border patrol in the Alps during World War II. The mountain range saw significant fortification during the conflict. Satellite photo showing the Alps in winter, at the top of the Italian peninsula. Swiss banks are known for their banking secrecy and security. Pictured: the Mont Cervin Palace in Zermatt. A hub of tourism, many private banks service the city and maintain underground bunkers and storage facilities for gold at the foothills of the Swiss Alps. Switzerland's mountainous terrain helps to store gold in underground bunkers. Citizens of Switzerland retain the country's strictest, most expansive, and unalienable banking secrecy protections as it pertains to taxation. The city of Zurich, the most important economic center of the country and one of the world's major financial centers, hosts the SIX Swiss Exchange. The Bank for International Settlements in Basel. The Swiss loot the camp of Charles the Bold after the Battle of Grandson of 2 March 1476 (Berner Schilling, 1480s). The first three volumes of the Historical Dictionary in each language. The Roman empire in the time of Hadrian (ruled 117 – 138 AD), showing, on the upper Danube river, the imperial province of Raetia, encompassing territories of what are now Switzerland, Tyrol and Germany south of the Danube.